“Two weeks ago I was fairly confident and then on New Year’s Day I was really confident but then that night I came down with something. This gave me a bit of doubt as I didn’t know how I was going to go." Rohan Dennis (BMC) defended his Australian TT title by beating Luke Durbridge and Ben Dyball into the minor podium positions. Rohan Dennis has claimed the gold medal for the second consecutive year in the individual time trial at the Australian Road National Cycling Championships, with a dominant performance that saw him take the win with a 58-second margin. As defending champion, Dennis was the last rider to roll down the start ramp for the 40.9km and put in a solid first half of the race. Although he crossed the line at the intermediate checkpoint three seconds behind Luke Durbridge (ORICA-SCOTT), Dennis put in a blistering run into the finish line to clock 50:59”, 58 seconds in front of Durbridge and 1:38” ahead of Ben Dyball. Dennis’ victory marks his third consecutive year on the podium, and the first win of the season for BMC Racing Team. Miles Scotson put in a solid effort in his first race for BMC Racing Team. The neo pro crossed the line with the fifth-fastest time for the day, 2:29” behind Dennis. “Two weeks ago I was fairly confident and then on New Year’s Day I was really confident but then that night I came down with something. This gave me a bit of doubt as I didn’t know how I was going to go," Dennis said. "A lot of it was severe hay fever symptoms and I think it was more than that, but I woke up this morning and I was feeling a lot better. So I just hoped that it would all come together today. “The head wind was huge on the way back and it just kills you as you are fighting it the whole time. It was harder than last year and more like the conditions we had two years ago. The last 5km hurt a fair bit. “Durbridge really threw it down on the way out and this stressed me out a little bit as I didn’t expect him to be up by three seconds. It was a fight all the way to finish and we weren’t getting time checks after the top of the climb so after 12km to go I didn’t have a time check. So I didn’t know if he held back on the climb and really booted it for the last 10-12km, so it was an absolute battle. I did blow up a little bit in the last 5km but I told myself to just not have massive power differences on the uphills and downhills and keep it a bit more even. It was more of a mental battle then. I just had to back myself and the power I was putting out which isn’t always easy when you’re on the limit. It’s a bit of a learning curve again. Former Australia road and time trial champion Luke Durbridge has claimed the silver medal at the Australian time trial championship in Buninyong. Durbridge reached the intermediate checkpoint as the fastest rider, taking advantage of the tail wind to hold a three second advantage as he turned for the tougher return journey. 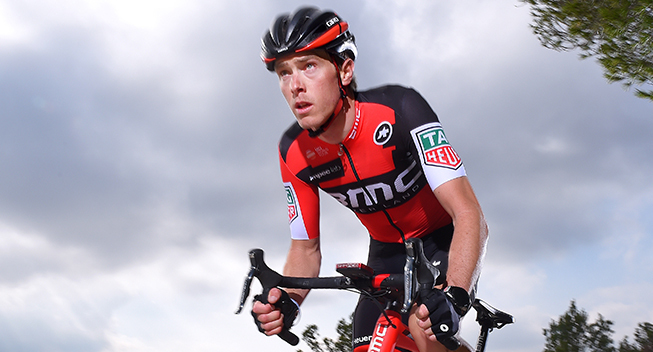 But at the end of the 40km course, it was BMC Racing’s Rohan Dennis who prevailed, finishing in a time of 50:59, 58seconds ahead of Durbridge. “I actually surprised myself,” the West Australian said. “Rohan is still head and shoulders above me at the moment but it’s been a while since I have been up there so hopefully I can keep closing that gap and get closer to Rohan. Durbridge, who also raced the Mitchelton Bay Cycling Classic, wasn’t targeting today’s race but recognised the rare opportunity to test himself in a time trial. “It definitely wasn’t the focus in January,” Durbridge said. “I just wanted to do my aerobic work in the off-season and then get ready for the classics. ORICA-SCOTT teammate MIchael Hepburn finished in fourth position, two-minutes and four seconds down on Dennis, while Ben Dyball rounded out the podium (52:37). Attention now turns to the elite road races on Sunday in Buninyong.